MONTREAL — With opening day around the corner, the Toronto Blue Jays plugged a hole in their starting rotation. 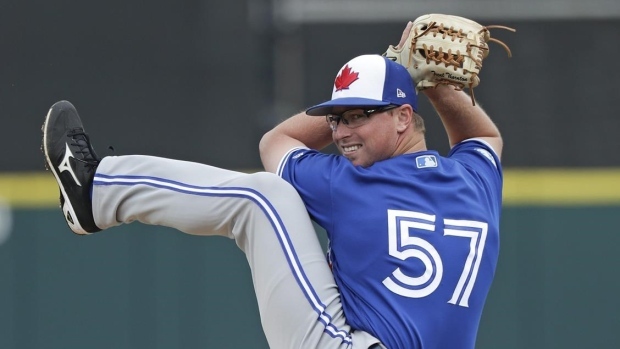 The Blue Jays named right-hander Trent Thornton to the starting five on Tuesday, giving the 25-year-old a chance to make his MLB debut while the team awaits the return of injured pitchers Ryan Borucki and Clay Buchholz. Thornton will be the fourth pitcher in the rotation in front of veteran Clayton Richard and will start Sunday against the Detroit Tigers. The other pitchers in Toronto's rotation are Marcus Stroman, Aaron Sanchez and Matt Shoemaker. "It killed me yesterday, I couldn't tell Trent," Blue Jays manager Charlie Montoyo said . "He was in Florida, so somebody else did." Montoyo made the announcement Tuesday before Toronto's pre-season finale against the Milwaukee Brewers — a 2-0 win for the Jays. His decision to start Thornton over Richard was based purely on matchups against their upcoming opponents. The Blue Jays play Baltimore after their opening series with Detroit. "Detroit is more right-hander heavy," Montoyo said. "And the Orioles are not, so that's why we're doing it that way." Montoyo didn't confirm that Thornton would be moved to the bullpen once Borucki returns from injury. The Blue Jays acquired Thornton from the Houston Astros in the off-season in exchange for infielder Aledmys Diaz. Thornton went 9-8 with a 4.42 earned-run average at triple-A Fresno last season. He was drafted in the fifth round by the Astros in 2015 and ranked Houston's No. 24 prospect at the time of the trade, per MLB Pipeline. With the five-man rotation set, Montoyo will turn his attention to the bullpen. While pitcher Sam Gaviglio has also made the team, Thomas Pannone remains in the mix as well. Montoyo says he'll keep the battle for the remaining spots until the end of spring training. Borucki, who was coming off a solid rookie season with Toronto in 2018, will open the year on the injured list with a sore elbow. The 24-year-old experienced elbow discomfort during spring training. Both Borucki and Ryan Tepera, also with an injured elbow, played catch prior to Tuesday's game. Montoyo added that Bud Norris was scheduled to throw a bullpen session today. He's been on the mend with forearm fatigue. "We don't want to rush him," Montoyo said. "We got to see how he's doing. He could be two more bullpens, another game, we'll see." "He's swinging the bat now," Montoyo said. "He's ahead of schedule. He's doing well." Buchholz and Tepera should be ready to join the big league club by mid-April, Montoyo said.